The UK is committed to maintaining a "frictionless" border with Ireland, regardless of whether a deal is struck to leave the EU, David Davis has said. The Brexit secretary added Friday's UK-EU agreement was conditional on reaching an "over-arching" trade deal. He described the agreement as "a statement of intent" rather than a legally-binding document. But the Irish government said that, as far as it was concerned, the deal signed on Friday was binding. 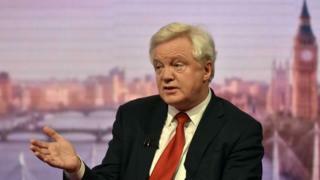 Speaking on the BBC's Andrew Marr programme, Mr Davis said: "I think if we don't get a deal we're going to have to find a way of making sure we keep the frictionless border - as it were an invisible border - in Northern Ireland. "We do it at the moment," he insisted. "Understand something - at the moment there are different tax and levy regimes and excise regimes north and south of the border. "We manage that without having border posts allotted along the 300 roads there and we will find a way of doing that." Last month, Taoiseach [Irish Prime Minister] Leo Varadkar demanded a written guarantee from the UK that there would be no return to checkpoints. The UK government struck a preliminary deal with the EU on Friday on three issues in order to allow the negotiations to move on to trade talks. 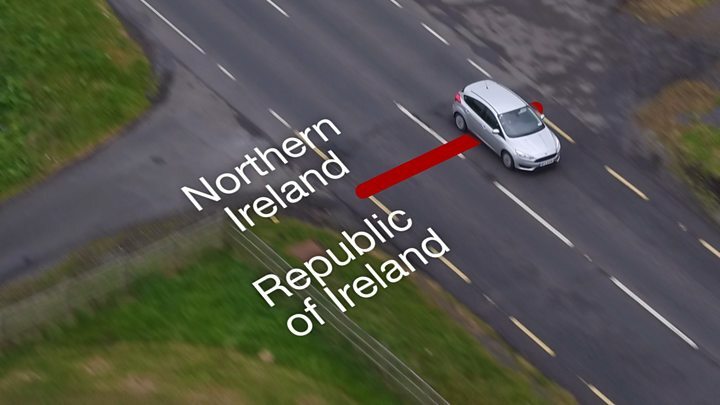 the future operation of the post-Brexit Irish border. The text of the border agreement, which was welcomed by the Irish government, pledged there would be no return to a hard border. The document also set out a fallback position if the UK fails to agree a trade deal, which said there would continue to be "full alignment" between the EU and Northern Ireland on some elements of cross-border trade. The "full alignment" scenario is likely to be controversial for the Democratic Unionist Party (DUP) which wants Northern Ireland to leave the EU, single market and customs union on the same terms as the rest of the UK. Mr Davis told the programme: "It was much more a statement of intent than it was a legally-enforceable thing." He explained that the government could preserve full alignment with elements of EU rules to maintain the status quo in Northern Ireland, but he said it would be a bespoke arrangement. "We're not looking to create a circumstance where animal welfare is worse in Britain than elsewhere. We're not looking to create a circumstance where safety of food is worse, or indeed pollutions of waterways. "So we will meet the outcomes, but not do it by just copying what the European Union does." Reacting to the interview, the Irish government's chief whip Joe McHugh said Friday's deal was binding. "The European Union will be holding the United Kingdom to account," Mr McHugh told RTÉ. Speaking on the BBC's Sunday Politics programme, Northern Ireland Secretary of State James Brokenshire said a hard border could be avoided as part of a new free trade deal. "This bold free trade agreement that we want to secure is very firmly in Ireland's interests, given the nature of trade between Ireland and the whole of the United Kingdom. "That's why we go into this second phase with confidence that we can secure that positive outcome, which is frankly the best way to solve this."